The acute scarcity of radio frequency spectrum has inspired to think of a new communication technology where the devices are expected to be able to sense and adapt to their spectral environment, thereby appearing as cognitive radios (CR) who can share opportunistically the bands assigned to primary users (PUs). At the same time, low cost, increased coverage, enhanced capacity, infrastructure-less configuration, and so forth, become the essence of future wireless networks. Although the two research fields came up independently, in due time it is observed that CR has a promising future and has excellent applications in wireless networks. To this aim, this chapter explores some scope of integration in CR and ad hoc networks (called here CRAHNETs) in some specific design perspective. First, a brief literature review on CR power allocation and energy aware routing in wireless ad hoc networks (WANETs) is done that highlights the importance for the scope of their integration. Then, power allocation in CRAHNETs with extended network lifetime is considered as an example problem. More specifically, the design problem is: given a set of paths (routes) between a pair of source (S) and destination (D) nodes in CRAHNETs, how to allocate optimal power to the source and relay nodes such that outage probability for data transmission is minimized and network lifetime is enhanced, while meeting the limits of total transmit power of CRs and interference threshold to PU simultaneously. A solution for the stated problem is proposed along with performance evaluation. A few related research problems are mentioned as future research directions. The need of efficient radio frequency spectrum utilization and an infrastructure-less network expects to determine to an extent the shape and dimension of future wireless communication system. Radio frequency spectrum scarcity problem becomes a serious issue due to the increasing number of wireless users and data intensive applications such as interactive and multimedia services. At the same time hope and scope are also seen through the recent measurement on spectrum utilization statistics that shows that most of the time large portions (about 15 to 85%) of certain licensed frequency bands assigned to primary users (PU) remain empty. This leads to a new look on developing the communication system where the devices are expected to be able to sense and adapt to their spectral environment, thereby appear as cognitive radios (CR), to become secondary users (SU). The outcome is the hope of cognitive radio network (CRN), where the nodes are capable of exploiting the increasingly flexible licensing of wireless spectrum (Haykin, 2005). Cognitive radio users (CRs) are allowed to communicate in PU bands when the later is absent or even with its presence provided that the interference caused by the former remains within the acceptable limits of PU. The issue of infrastructure-less wireless network may be taken care in multihop wireless systems such as ad hoc, mesh or sensor networks that look promising due to its various attributes like low cost, ease of deployment, increased coverage, enhanced capacity etc. Different communication services to be supported are voice over IP (VoIP), audio streaming, or video streaming as well as traditional data communication to demand-driven applications like healthcare, health monitoring of different structures (like bridge, building, etc. ), a few examples. However, the two communication resources, namely the scarcity of power and bandwidth need efficient and intelligent utilization. Since, a node in such type of networks typically may be a laptop, a personal digital assistant (PDA) or any mobile devices with power supplied by battery, design of an energy aware communication protocols is highly demanding. It is true that both the CR system and many typical application specific WANETs, in their present forms, are far away from the commercial viability. 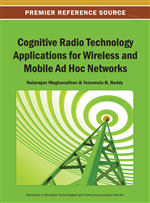 Still the scope of their integration in the form of cognitive radio ad hoc networks (CRAHNETs) looks promising as an infrastructure-less opportunistic communication system that may serve specific applications. Primary goal of CR system is to minimize or maintain interference threshold to PU (to meet its interest), while one of the important design objective of multihop ad hoc network is to maximize network lifetime which is determined by the residual energy of the source and relay nodes (may be CR users) in source-destination (S-D) paths. Optimal power allocation plays a key role to integrate these two apparently uncorrelated issues. To this aim, the chapter explores the role of power allocation in CR (multihop) ad hoc networks (CRAHNETs) with energy constrained nodes and in wireless fading channels. Hope the readers will be benefitted for developing the similar integrated system design to meet certain other well-defined objectives. Our subsequent discussion follows the sequences: a brief literature review on power allocation in CR system followed by energy aware routing scheme in WANETs, then an energy aware power allocation scheme for minimizing outage probability in CRAHNETs is suggested along with performance evaluation. Few related research problems are mentioned as future research directions followed by concluding remarks for the chapter.